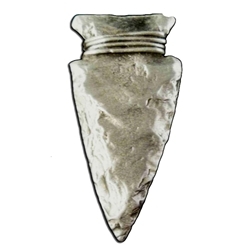 The Arrowhead Sewing Button features a Indian arrowhead. This button is 7/16 of an inch tall by 11/16 of an inch wide. Our Arrowhead Sewing Button is made from lead free pewter in the USA. It would be great for any sewing, knitting, or costuming project. It has a shank on the back of the button to securely attach it to your garment by sewing it on.